When the cold is coming we start with the winter projects. It is the time when women remember the beautiful pieces of sweaters, scarves, shawls, models of hats, gloves, shoes, and even better everything being crochet we love. What crochet bring us many good things, manual art is done in a lovely and lovely way. We can make many variations with the same pattern. For this reason we see so many variations and so much pattern on the internet and we find many step by step that teaches us from the simple level models from beginners to the most complex of advanced level. Here on our site you will find many winter patterns plus many others. Many patterns with videos, graphics, step by step and still many tips and patterns bring everything with all the information very well explained. With the cold in the crocheteras we go behind of patterns that warm us and also who sells must follow the needs and demand.Today I bring a beautiful crochet work, prepare your materials and let's learn one more with us. In addition to many crochet work for the winter we have the cap that is very used to warm us up and also to complement our look. Today's pattern is a beautiful crochet cap that will ensure comfort and warmth. For all who are passionate about caps of all models, large, small, thin or thick, detailed or even simpler. For all those who always love and want to have a crochet, this is the time, learn a model today with a very beautiful and worked cap that really is very difficult to not like. Choose the color yarn you like best and make beautiful pieces. The hats are many used to warm and give a charm in the look, so enjoy and do yours now. 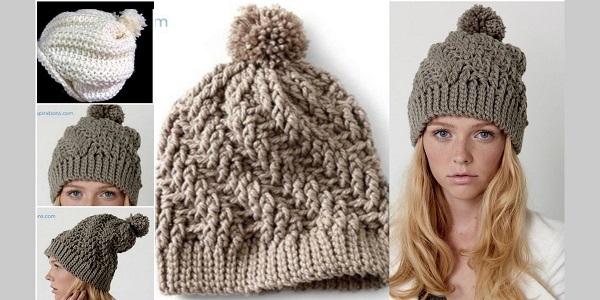 The crochet cap is part of the women's and men's wardrobe in winter, it is an accessory to wear most often in winter in cold towns. Although it is used in cold weather or in winter, it is not necessary to use only these climatic changes. When the cold starts you can take your crochet cap that will look beautiful and elegant. For those who have crochet skills, hooking with the hook and threads, nothing better than making this pattern because it is beautiful and this model you can do the way you want, you can change the color, use two colors, apply appliques crochet you choosing. Make the model of your taste and being original. Make many models if you sell, thus pleasing all tastes in various formats, various colors or one color, with ear protection, thicker or thinner. Below is the video tutorial on how to make this model of cap, following the step by step you can do this beautiful work both female and male. Enjoy every information and do beautiful work, do not forget to enjoy our page on facebook Xell Crafts.